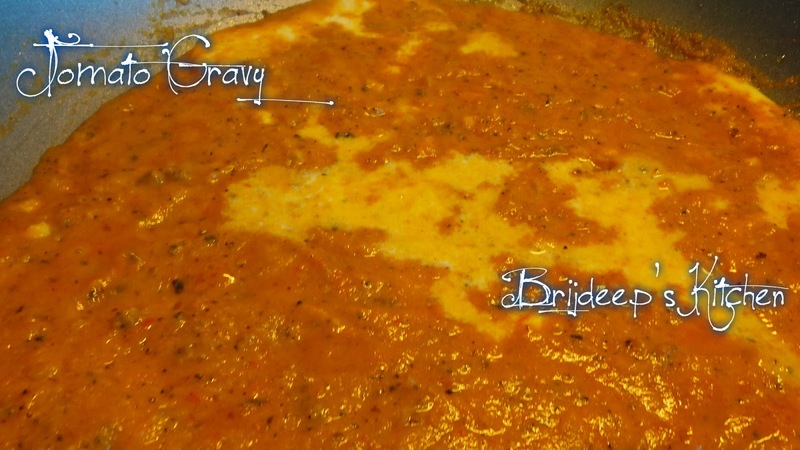 Tomato gravy is one common base for so many Indian recipes and every household has their own version of tomato base curry. 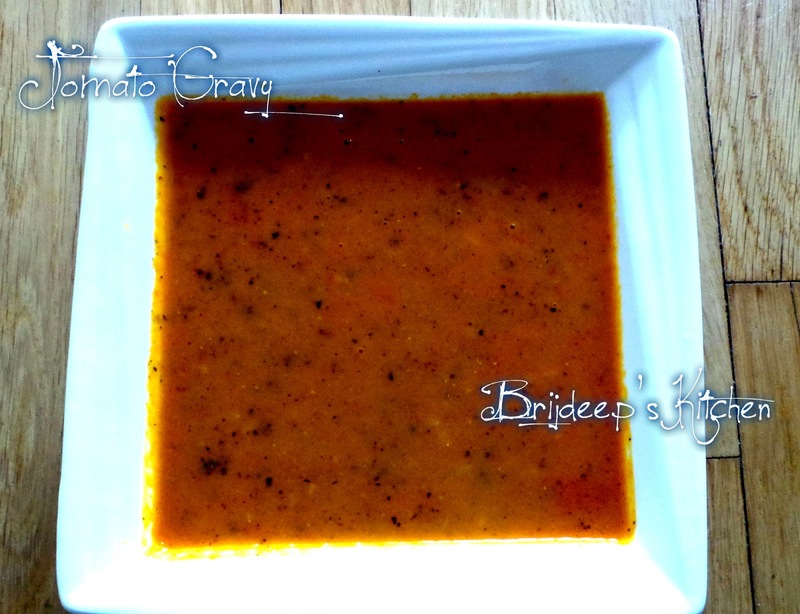 This tomato gravy can be used as a base for chicken, paneer, kofta etc. 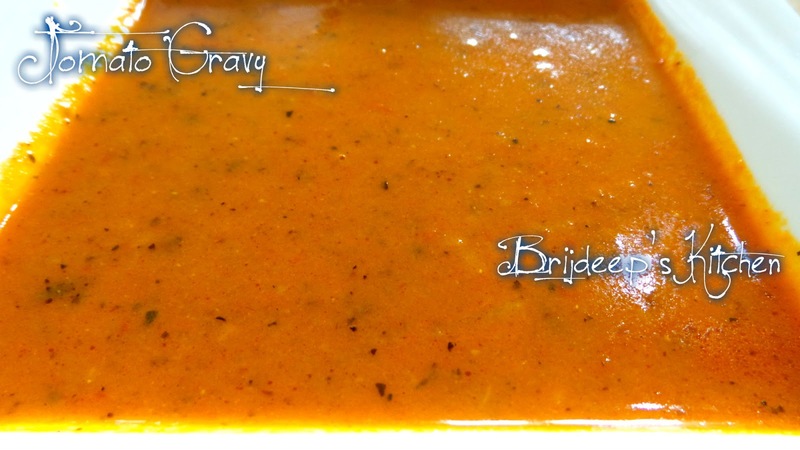 and can also be frozen to always have ready gravy to be added to any dish and your lunch/dinner will be ready in no time !! Soak the cashews in a little water and keep aside. Heat half the oil and crackle all the whole spices: green cardamom (seeds and covers both), black cardamom, javitri, jaiphal and cinnamon. Fry for half a minute and add the chopped onions. Stir and fry until the onions turn transparent but not brown. Add the tomatoes and sprinkle salt. Let cook until the tomatoes are cooked and become soft and mushy. Turn off the flame and let this mix cool completely. Grind it to a fine paste without using any water. Drain the water from the cashews and make a coarse paste of cashews in a mortal pestle and keep aside. Heat the other half of oil and add bay leaf. Add the ginger-garlic paste and fry until the raw smell goes away. Add the dry spices: red chilli powder, turmeric powder, cumin powder, coriander powder and kasoori methi. Mix well and let cook for a minute. Add the ground onion-tomato paste and mix everything well. Add the cashew paste and sugar after a minute and let everything fry well until the gravy starts leaving oil on the sides. Turn off the flame and use it in dishes directly or let cool completely and freeze in batches for future use. To make butter paneer masala: In this gravy, add the paneer and in a separate pan, heat a little butter, crackle mustard seeds and dried red chilli. Let fry for a minute and add garam masala; mix and turn off the flame. Pour this over the gravy with paneer. Butter Paneer Masala is ready. To make palak paneer: Boil and blanch the spinach and let cool. Grind to a fine paste with green chillis. Add paneer cubes to the tomato gravy and the spinach paste; mix and stir, let cook for a minute and turn off the flame. Do not cover. Palak Paneer is ready. 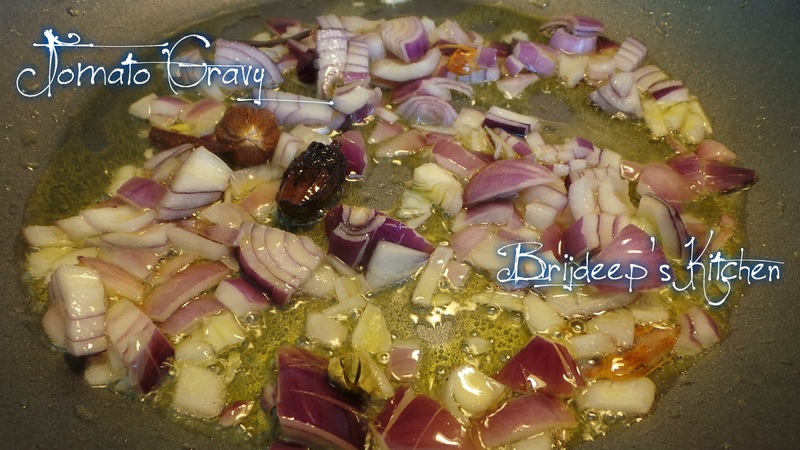 To make kofta: Use this gravy for lauki kofta or malai kofta. Skip the sugar, kasoori methi and cashews and dunk the koftas in this gravy and enjoy. To make green chicken: marinate chicken in a paste of green chilli, mint, coriander and lemon juice for 4 hours or overnight. Heat oil and add cumin seeds and cloves. Add the marinated chicken and fry for few minutes. Cover and let cook until done. 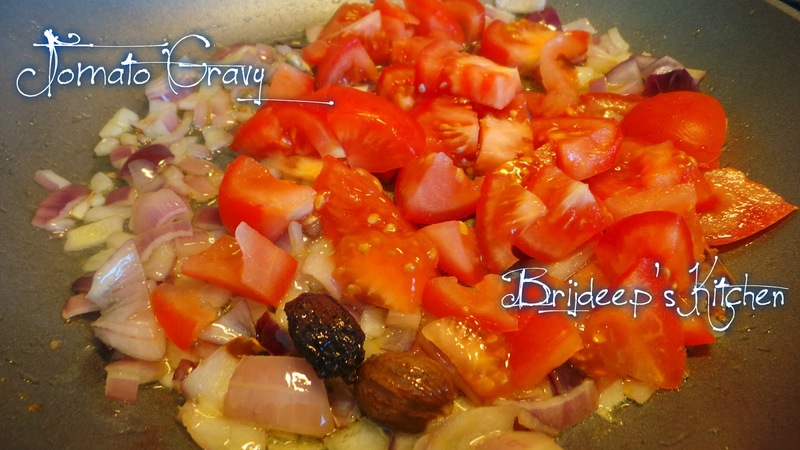 Add this chicken mix to the tomato gravy and green chicken curry is ready. To make vegetable korma: Heat oil in a pan and crackle the mustard seeds and dried red chilli. Add the vegetables: potatoes, cauliflower, carrots, peas and fry for about 5 minutes. Add yogurt and mix well. Let cook covered until the vegetables are done. 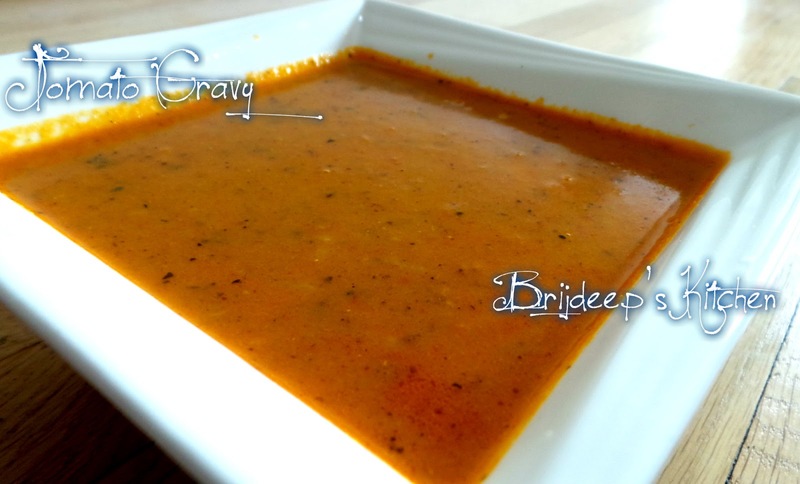 Add a cup of tomato gravy to this mix and your vegetable korma is ready. To make vegetable pulao: In the same method as making vegetable korma, add boiled rice and mix everything well. Vegetable pulao is ready. To make egg curry: Boil eggs and peel them. Heat little oil and add ginger-garlic paste to the oil. Add the eggs and sprinkle little red chilli powder and fry the eggs from all sides. Remove from flame. Add the fried eggs to the tomato gravy and egg curry is ready. To make chhole masala: Heat oil in a pan and crackle cumin seeds. Add chopped onions and fry well until they are transparent. 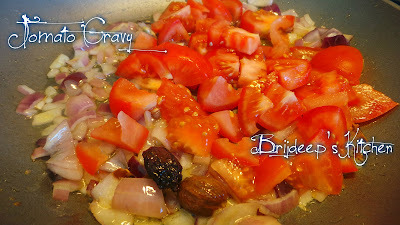 Add 1/2 cup of tomato gravy and mix well. 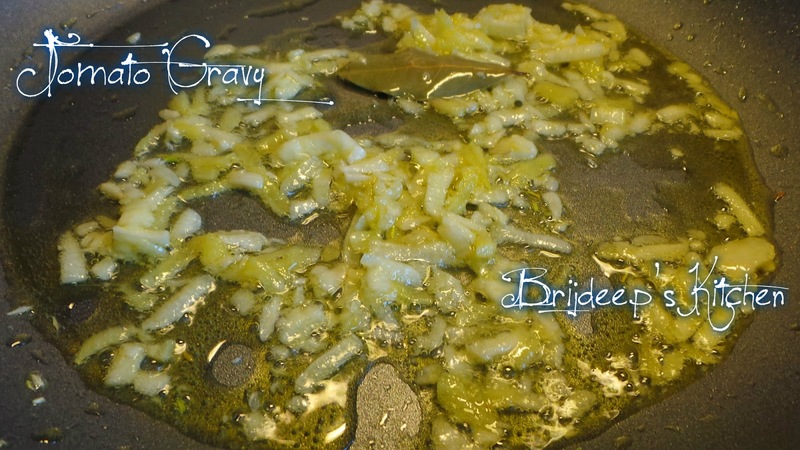 Let fry until the gravy starts to thicken up. Add the boiled chhole (white chickpeas) and mix well. Adjust salt and red chilli. Let cook for 5-7 minutes and turn off the flame. Garnish with coriander and serve as a quick side dish or to carry in lunch box. To make Aaloo Matar Subzi: Heat oil in a pressure cooker and crackle mustard seeds. Add chopped onions and fry until they are transparent. Add the chopped potatoes and peas and salt and turmeric powder. Add little water and close the lid. Pressure cook for 3 whistles and let the pressure release. Open and add tomato gravy and mix well, let cook everything for 5 minutes and turn off the flame. Aaloo Matar Subzi is ready. To make Achaari Mix Vegetable: Dry roast dry red chilli, fennel seeds, coriander seeds, mustard seeds, fenugreek seeds, cloves and bay leaf. Cool and grind to a powder. Heat oil in a pan and add the vegetables: potatoes, cauliflower, beans, carrots, peas and sprinkle salt. Let cook for about 5 minutes. Sprinkle the spice powder and add little yogurt. Cover and let cook until the vegetables are done. Remove cover and add tomato gravy (don't add a lot of gravy, just about 1/2 cup) and mix everything well. Cook for 2-3 minutes and Achaari Mix Veg is ready. If this post has been useful for you, please leave a comment and/or feedback. Loved this post? Join me on my Facebook Page for regular recipe updates.